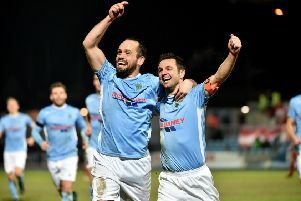 Portadown and Ballymena United served up 10 goals at Shamrock Park on Saturday. Gary Twigg grabbed three, with Peter McMahon and Darren Murray the other home scorers. Gary Twigg with the match ball following his hat-trick against Ballymena United. Pic by PressEye Ltd. The Ports held a 5-3 lead with 81 minutes on the clock but conceded late on to finish with a point.